I am not a fan of Colleen Hoover's work. At least not most of her work. I don't exactly hide the fact that I don't appreciate how overly dramatic her books are. On top of the already heavy plot is a mix of characters with colorful backgrounds. And when I say colorful, I mean over the top stressful. It's as if one bad thing isn't enough; there has to be more than one thing that's wrong with the characters. Oh, he's deaf, but he can create beautiful music because he has a tormented soul thanks to his horrible home life (or something like that... kind of blurred out Maybe Someday). It's not that I am against books that deal with themes that are hard to swallow. There's just always too much going on in a typical Hoover book. However, such is not the case in Confess where there was a noticeably better balance. Auburn, our protagonist is strong, attractive, and an all-around "good girl" — much like Hoover's other female leads. The only difference is she's not as complicated. She has a secret that will explain a lot as the story goes, but it's nothing heavy and dark. Sure, it was a huge surprise (to me at least) but it's not like she was constantly tormented with this secret. The same can be said about Owen, the love interest. He's light (mostly) and quirky, which already sets him apart from a lot of male leads in the same genre. It was refreshing reading a Hoover book with characters who weren't too much of everything. The problem with new adult characters who have deep dark secrets is that they spend 80% of the time brooding and the 20% getting over themselves and reversing the broodiness with whatever happiness they have left in them. Character backgrounds are great and all but when there's way way WAY too much of it, it adds an unnecessary heaviness to the story. Fortunately, Auburn's character was well-balanced and she has a partner that complements her well. 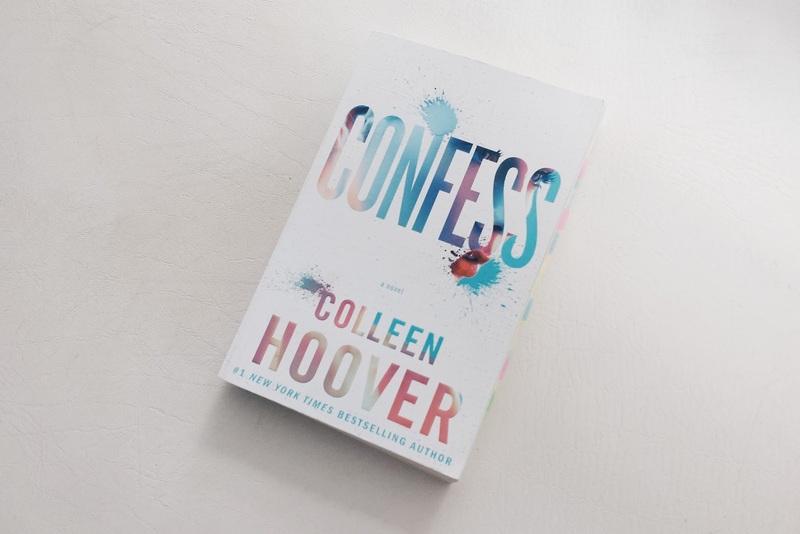 It didn't get so stressful reading Confess, and that ultimately helped me enjoy the book despite the sad tone of the story. That's the thing. Right off the bat, you know that it's not a happy love story. But because there was just the right amount of tension and light moments, it wasn't like I was forced to feel what the characters were feeling. I think this time around, Hoover was able to effectively create a novel that can connect with readers without dumping too much conflict in one story. There were plenty, but it wasn't overkill THANK GOODNESS. So whatever sympathy I felt for Auburn and Owen was only natural. One thing though that I didn't particularly like was how infatuated Owen was with Auburn in the beginning. This is connected to his secret and how he's tied to Auburn. Revealing Owen's secret was a good ending, but considering the entirety of the novel, it's annoying how so much is hinged on that one thing. Although it is entirely plausible and possible, I didn't quite buy it. But hey, it is a fictional romance so of course people can form feelings and attachments just like that. That's the magic right there. Did Confess change my mind about CoHo? Yes. Yes, it did. In fact, I went on and bought Never, Never books 1 and 2 right after I finished it. (I'll post a review for them but spoiler alert: I LOVE IT) This just goes to show that there's always some wiggle room when it comes to liking an author's work. All it took for me was a bit... okay, a whole lot of open-mindedness.